Editor’s Note: This biweekly column is sponsored by Dominion Wine and Beer (107 Rowell Court, Falls Church). This column was written by Garrett Cruce, a Cicerone Program Certified Beer Server, who also writes about beer on his own blog: beerbeltway.wordpress.com. 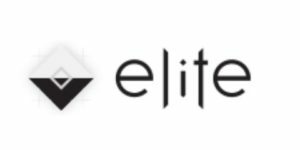 Catch new posts there on Sundays. As the clock ticked its way toward 2016, I wasn’t toasting with champagne but with grape infused beers and ciders! Though it’s not a new trend, adding grapes, the essence of grapes, or wine to beer is getting some new recognition. In fact, a Google search of wine and beer blends or hybrids yields a bunch of articles from 2013. 2013 saw the release of one of the more widely distributed beer-wine hybrids — Sixty One from Dogfish Head Craft Brewery — which will actually cease production in 2016. Even without Sixty One, Dogfish Head still brews four beers that include grapes or wine, including two of its oldest: Raison D’Etre and Midas Touch. Originally, the only link to wine that one could find in beers was in the essence derived from aging beer in used wine barrels. In recent years, brewers have decide to branch out more by adding grapes or their juice to beers. Sometimes they add something called must — the grape juice, skins, and seeds. The results are a complex brew with fruit tones to accompany the malt. Hard ciders have also been seeking ways to add diversity in flavor. Trying to separate your cider from the seemingly countless flavor combinations that big players like Boston Beer Company-owned Angry Orchard offers requires creativity. One cider maker got creative and blended Pinot Grigio, making for a distinctive hard cider. Whether a new brew or an aged one, brewing with grapes or aging in wine barrels introduces new dimensions. Below are three beers and one cider that looked to the vine in one way or another. Starting with the non-beer, the Cider Brothers’ William Tell Pinot Grigio Hard Apple Cider is the most wine-like of all the beverages here. The brothers start with cider from five apple varieties and add in 15 percent California Pinot Grigio. 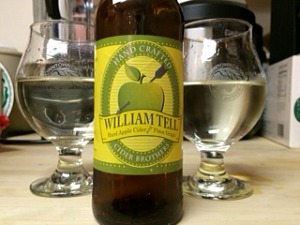 The result is a crystal clear yet pale green, lightly carbonated beverage that looks as much like a Pinot as a cider. Freshly cut grass, green apple and white grapes rule the aroma, not surprisingly. The flavor is melony and slightly tart with the apple emerging in the middle of the sip and taking over for the finish. Sweetness is minimized, making the fruit and wine the centerpieces. This was a crisp and original take on the style. Perennial Artisan Ales may have just released their Instagram favorite Abraxas imperial stout, but their stable of sours deserves quite a bit of recognition. Savant Beersel is a Belgian-style pale ale fermented with the wild yeast — Brettanomyces — and infused with Missouri-grown wine grapes then aged in wine barrels. The result is a complex and fruity sour ale. Savant pours violet with a fine lavender head that quickly dissipates. The aroma is a challenging mix of sour grapes and musty rag — Brettanomyces brings an earthiness to ales that can be an acquired but rewarding taste. Sipping, however, reveals a different side to this beer. It starts out tart and malty with a red fruit tanginess then finishes lightly sweet. My immediate and lasting impression was of drinking a sour Welch’s grape soda. 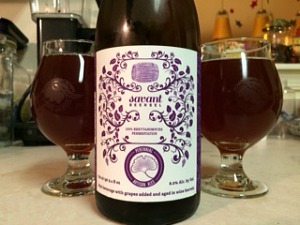 Originally released in 1999, this is among the oldest grape-infused beers on the market. 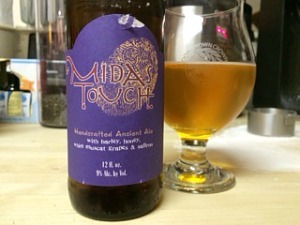 Dogfish Head Craft Brewery’s first “Ancient Ale” Midas Touch is based on the reverse-engineered recipe of beer that was recovered from residue in jars found in King Midas’ tomb in Turkey. Having been there, it’s always fun to sip this drinkable, but strong beer. Brand new this year, Port O’ Call is Utah’s Uinta Brewing Company’s first foray into wine barrel aging. Though this beer doesn’t include grapes or wine, the port wine barrels from Portugal bring a fruity complexity to the already bold strong dark ale. Pouring dark brown with a light head, Port O’ Call entices with a heady aroma of dark raisins, tamarind and woody spice. The flavor is as complex as the aroma with banana, ripe plum, vanilla, and the oaky quality that old school Cabernet Sauvignon’s exhibit. The Belgian style strong dark ale is also known as a quad, and they tend toward the sweet and malty. 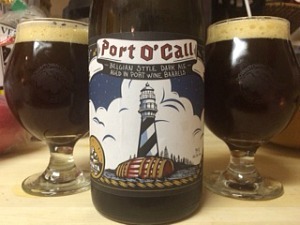 Port O’ Call, however, is strong and dark but with a light finish that keeps it from feeling heavy. At more than 9 percent, the alcohol is strong enough for this to be a sipper, but it doesn’t overwhelm. Whenever I try Uinta’s Crooked Line beers, I’m reminded that they consistently create a unique and quality beer. Though they don’t qualify as “stand-in-line” beers, I’d gladly enjoy a Crooked Line beer for any special occasion. What wine or grape/beer hybrids have you tried and enjoyed? Tell me below. Happy New Year from all of us at Dominion Wine and Beer! The views and opinions expressed in the column are those of the author and do not necessarily reflect the views of ARLnow.com.